As leaders in their communities, they work extensively at the forefront of community initiatives and serve as important change agents helping to realize long-term sustainable solutions on a variety of issues in areas such as education, youth development, economic development, and community infrastructure projects. It is because of their partnership that Peace Corps has been able to continue to work towards its mission of promoting world peace and friendship for more than 50 years. For this reason, we desire to give counterparts a chance to share their stories as well in a new “Counterpart Spotlight” series. Thank you to all of the counterparts who have been our allies over the years. We greatly appreciate all the work that you do! My name is Isabel. 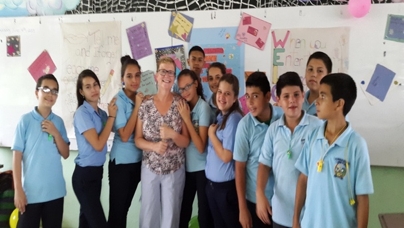 I have been an English teacher at a local high school in the Limón province during the past ten years and I teach conversational English to seventh and ninth grade students. The community where I work and teach is a rural community where there are not many job opportunities. Despite the fact that the community is very small and in a rural area, the institution has about five hundred students. Most of the students live near the high school and travel by bicycle or on foot. The students who live far away from the institution travel by bus. Most of them are extremely poor. Drugs and violence rates are very high in the community. For those reasons I saw the need to work with a Peace Corps Volunteer to motivate my students to learn a new language. Since 2015, I have collaborated with three Peace Corps Volunteers in a variety of ways. My experience with Peace Corps has made a positive impact in my community with the students and English teachers. My first PCV was Karen, who gave me the golden opportunity to implement wonderful new ideas with my students. 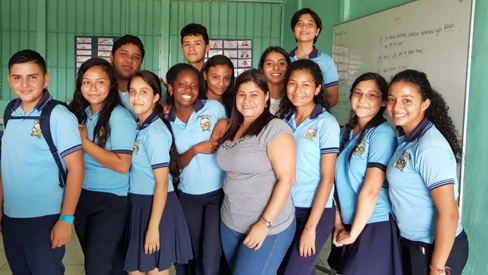 She only was in the institution for five months because she was part of the group of Volunteers that collaborated with the brand new English curriculum for Costa Rican public schools (launched in 2017). I know that without her help I would not be the professional I am today. I am renewed with excitement to innovate and do better things to help my students learn in fun ways. Thanks to Karen, I was able to overcome a personal and professional challenge-my fear of public speaking in English. With Karen's guidance and coaching, we were selected as co-presenters at Costa Rica's 2016 National Conference for English Teachers (NCTE) Our workshop, “Dare to Celebrate English: How to have a successful English Festival,” was a success! It was a fabulous experience. Thanks, Karen! 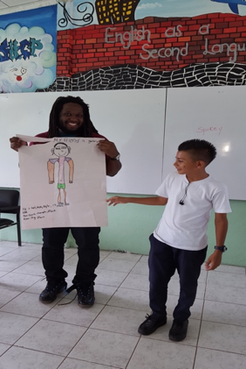 In 2017, Ryan, another PCV from a nearby community teaching in a night school helped our community and high school for four months. Ryan was a leader for my students who taught them to have confidence in themselves and that with love and dedication they can achieve great things. 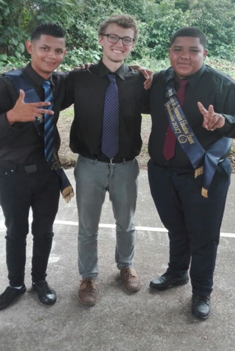 Ryan was able to make the students lose their fear of speaking English, and was a genuine help to us. Thank you for believing in my students, Ryan. They will thank you forever. Our school's third Volunteer has come to revolutionize the institution not only in teaching English but also in music and sports. 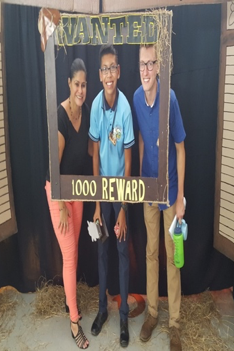 After a few months of being with us, our new Volunteer, Ethan, has won the hearts of all. In spite of his youth he has fully integrated into the institution and has demonstrated his great professionalism in the classroom and beyond. Thank you, Ethan, for being part of our institution and our community. We will always thank you for having made us part of who you are. Thank you, Peace Corps, for allowing our community to meet wonderful people who come to Costa Rica to touch our hearts. A profound thanks to all the Volunteers who make great contributions to our educational system. May God pay them for the noble work they do in our country. Isabel was born in San Jose, Costa Rica and grew up in Guapiles, Limon. She is the daughter of Edelmira and Rafael and has two sisters, Lisseth and Carmen. Her greatest pride and joy is her family. She has been married for 23 years to husband Alvaro and has an especially close bond with her nephew Geison and niece Victoria. In her free time, Isabel enjoys traveling, reading, watching T.V., and cooking, though she tries to spend most of her free time with her family and her beautiful dogs Lola and Sury. When Isabel was in high school she had an English teacher that inspired her to study English. Thanks to her former English teacher, today she is proud to say she chose the best profession in the world. Working her first three years in primary school and almost 10 years in high school, Isabel has been a teacher for the Ministry of Public Education for almost 13 years. She loves her students dearly and considers them a fundamental part of her life.